An independent website has been told to stop putting footage of FA Premiership goals on the video website YouTube. NetResult - a firm monitoring the internet on behalf of the Premier League - emailed a warning to the website, 101greatgoals.blogspot.com. It told the website it was "infringing" Premier League copyright. Links from 101greatgoals to YouTube were thought to have been disabled by YouTube itself but other links to Premiership goals stayed in place. The news comes after the video-sharing service wiped nearly 30,000 files from its website after Japanese media companies said their copyright was being infringed. The Japan Society for Rights of Authors, Composers and Publishers found 29,549 music video, movie and TV clips had been posted without permission. 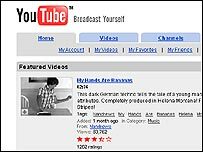 YouTube, which was launched in February 2005 and shows about 100 million clips per day, was recently bought by search giant Google for $1.65bn (£883m). Critics of the deal have warned Google could face a barrage of lawsuits over copyrighted material on YouTube. YouTube mostly hosts homemade videos, however, it also contains clips of copyrighted material. It has recently signed distribution deals with media groups including Universal Music Group, Warner Music and CBS to offer short-form programming including news, music videos, sport and entertainment. The BBC is currently prohibited from showing footage of Premier League goals on its website. But from next season Match Of The Day and MOTD2 will be streamed on broadband as simulcasts with the TV programmes for UK users - meaning all the Premiership goals will be available online for the first time in the UK.